While nobody ever wants to think about a fire striking, that doesn’t mean you don’t prepare just in case. You have smoke detectors and alarms and chances are, if you have children, you’ve discussed an emergency escape plan. But have you thought about your basement? 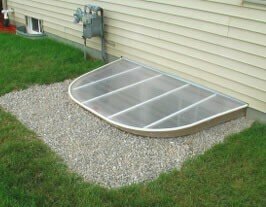 If you’re finishing a basement that is below ground and doesn’t have an escape, then chances are, you may require an egress window. Egress is literally defined as “path out” and that’s exactly what purpose they serve. Egress windows are windows that are large enough (as defined by local ordinances) for a quick exit in the event of an emergency, such as a fire. Should the stairway be blocked by flames or smoke, an egress window could be a vital, lifesaving feature. Of course, they provide other benefits, too. Incorporating an egress window adds natural light to your basement, which can brighten up an otherwise dark space. Egress windows also add value, too. Should you ever go to sell your home, there’s no doubt that buyers will be looking for basements with “usable space” and that’s exactly what an egress window adds. It brings your basement up to code, transforming it into safe, livable space. By choosing to add an egress window, you are making a wise decision to protect your family—as well as the resale value of your home. Plus, you’ll make your space more usable and attractive. At the end of the day, it’s a win all around.